Did you guys see me on Facebook Live the other day sharing my latest coffee obsession?? 1850 Brand Coffee, from the makers of Folgers, has taken over my coffeemaker lately replacing my other favorite coffee brands. So to celebrate, I thought I’d not only show you guys everything I love about this new brand, but also a little DIY Glitter Mug that would make for the perfect way to gift 1850 Brand Coffee to another coffee lover, just like me. 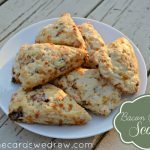 And with Mother’s Day coming up, why not learn a little DIY Coffee Gift Idea that’s easy for kids to make and mom (or dad!) to enjoy! 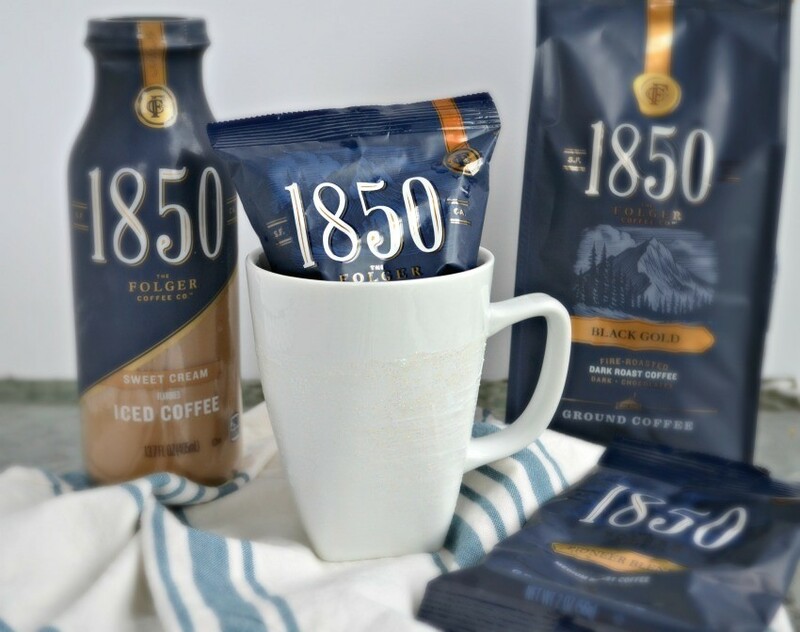 1850 Brand Coffee is a new premium coffee from the makers of Folgers. 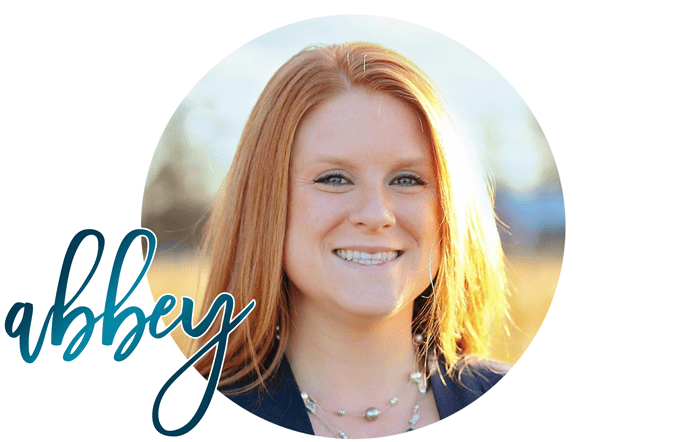 It is available in four signature blends of Ground and K-Cup coffee and is also be available in 3 Ready to Drink flavors–all at Meijer. 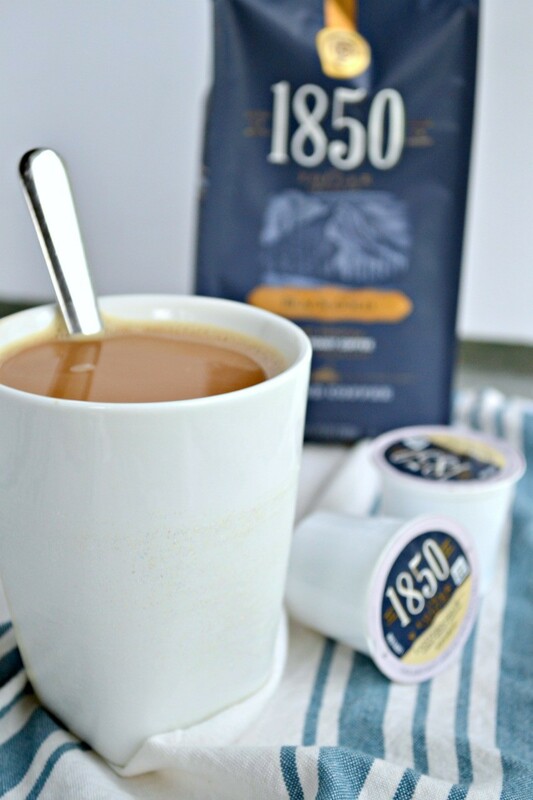 1850 Brand Coffee is a bold new coffee with a smooth profile. Like the coffee is named, I can start each day with the spirit of adventure and excitement for what the day will bring. Your life starts with a first bold choice and every bold day has a morning. Back in 1850, J.A. Folger started something new and innovative to help the prospectors as they sought their fortunes. Today, there’s still no better way to get after it than with a bold-yet-smooth cup of coffee. 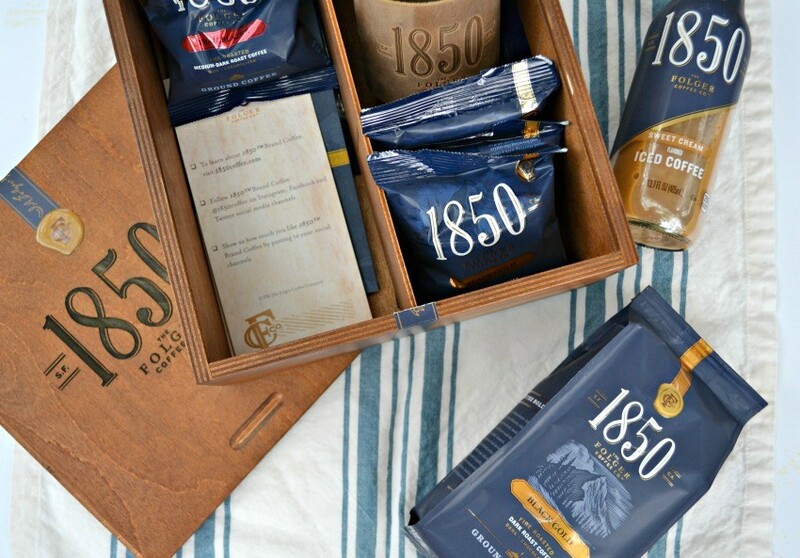 1850 Brand Coffee is the official coffee of bold people fueling original ideas, new commitments, and brave endeavors – ultimately becoming more than a coffee, but an ally to the hustle. 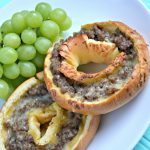 Its beans are fire-roasted and ground to help bring out rich taste and aroma with a bold and smooth, never bitter, taste. All you need is Mod Podge Glitter Extreme, a mug, and a brush. 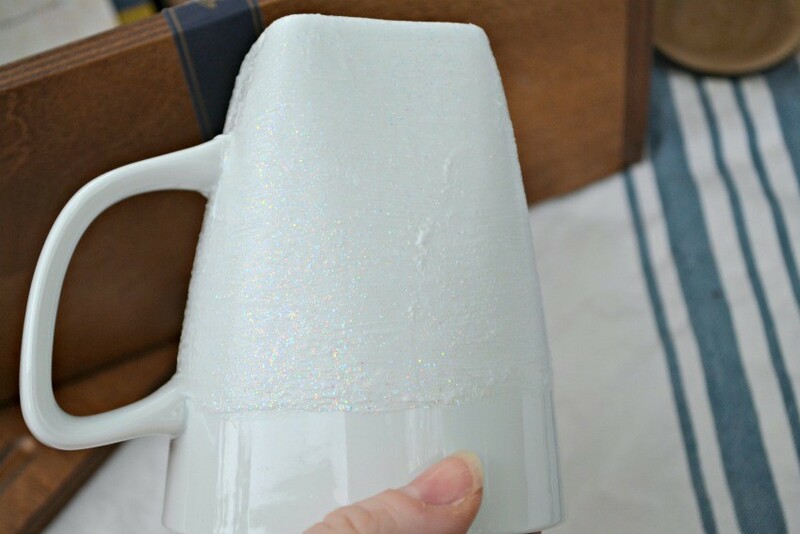 I start by applying a thick coat of the Mod Podge Glitter Extreme to the bottom of the mug. 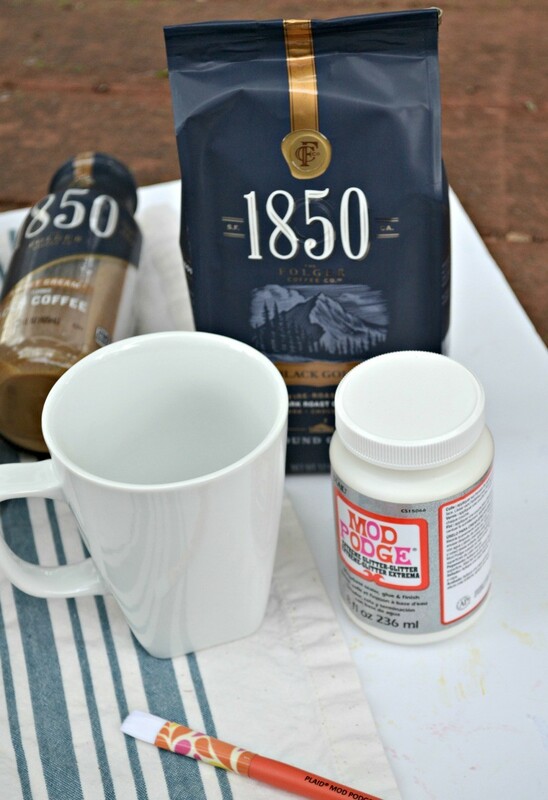 You can tape off your mug or just “wing it” with how you apply the mod podge. Just don’t go all the way up to the top…leave some room. 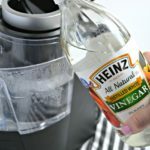 Mod Podge Extreme Glitter is safe and non-toxic, but you cannot wash this in the dishwasher. It has to be hand washed. Apply as many smooth coats as desired to get your glitter effect and then let dry completely. Once dry, add your desired 1850 Brand coffee blend or K-cups to the mug and gift for your favorite person that can appreciate a bold new coffee! 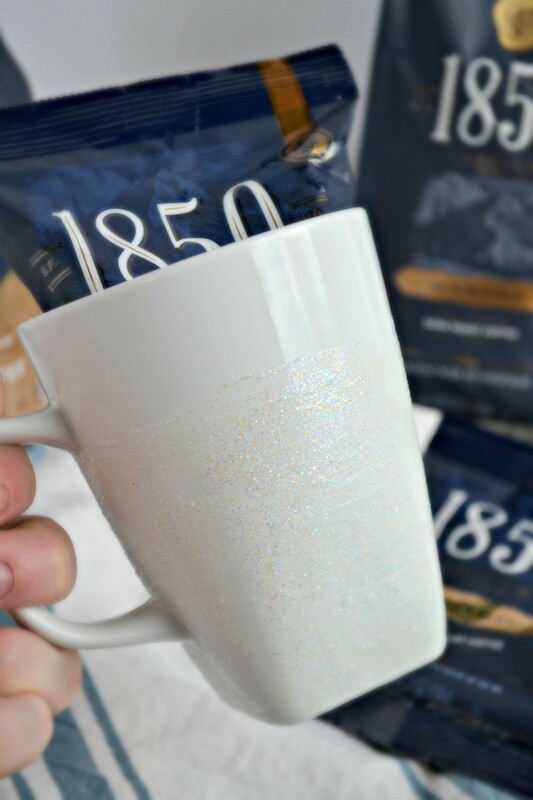 I love how the pop of glitter at the bottom adds a fun little pop of unexpected uniqueness to the mug…just like how 1850 Brand Coffee does to your mug! 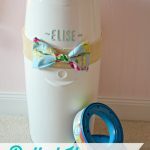 I hope you enjoyed this easy DIY Gift Tutorial! There’s nothing better to me than combining my two loves…coffee and crafting, into one! Be sure to visit Meijer from 5/6 – 6/2 and take $1 off any 1850 Brand Coffee product with the mPerk digital coupon (while supplies last).